The latest Sims 3 expansion will add eyepatch-wearing scallywags and plenty of scurvy. I don't get excited over the announcement of a new Sims expansion often, mostly because there have been thousands of them, but EA's latest has a theme we can all get into: pirates. Revealed today was Barnacle Bay, a downloadable Sims 3 expansion pack that will fill the game with pirates from shore to shore. Well, maybe not from shore to shore, but it'll add a brand new pirate-filled world at least. Barnacle Bay features 50 new characters to find including gypsies, ghosts, and pirates. 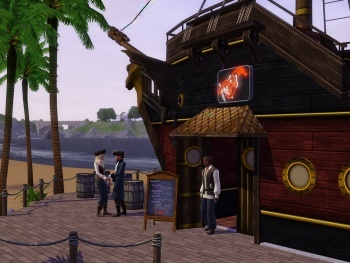 It isn't a totally pirate-focused area, but players will be able to eat in the nautical Hogan's Deep Sea Diner and catch bar fights at The Wanderer's Watering Hole pub. They'll also be able to build their own pirate-themed houses with new objects such as porthole doors and wharf fences. The ultimate pirate destination will be the super-secret Pirate's Hideaway, if players can find it. Not to worry, EA is also releasing the Buccaneer's Bounty, a pirate clothing set of 7 items such as hats and boots, but it won't include a peg leg unfortunately. Players also regretfully will remain landlocked and won't be able to sail the seven seas of Barnacle Bay. I'm liking the partial themes of each of the Sims 3 expansion packs we've seen so far though, featuring mummies, robots, and vampires in the past, and now pirates. Barnacle Bay will be released exclusively as a download on the online Sims 3 store for a TBD price on September 23.